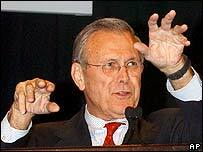 US Defence Secretary Donald Rumsfeld has declined to criticise a senior army officer who told audiences the war on terrorism is a battle with Satan. Evangelical Christian Lieutenant-General William G Boykin was also quoted as saying a Muslim warlord in Somalia had an "idol" for a God. Secretary Rumsfeld, questioned by journalists, defended the general's statements as "a private affair". But a Muslim group in the US called his comments "bigoted" and demanded his resignation. Lt Gen Boykin enjoys a glittering military record as an officer and a commando and is currently deputy under-secretary of defence for intelligence. However, it is his fiery evangelical Christianity that has brought him suddenly to national attention, says the BBC's Adam Brookes in Washington. An American newspaper found him addressing church congregations wearing his uniform. He told audiences that terrorists hated America because it was a nation of Christian believers and that the enemy in the war on terrorism was Satan. In one speech, he recalled a Muslim fighter in Somalia who said he had the protection of Allah against US forces. 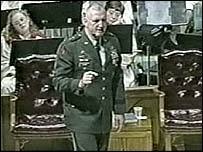 "Well you know what I knew, that my God was bigger than his," said Lt Gen Boykin. "I knew that my God was a real God, and his was an idol." His remarks brought anger from the Council on American-Islamic Relations. They point out a verse in the Koran that says Muslims believe in the same God as Jews and Christians. "Putting a man with such extremist views in a critical policy-making position sends entirely the wrong message to a Muslim world that is already sceptical about America's motives and intentions," said the council's executive director Nihad Awad. At a Pentagon briefing, Donald Rumsfeld said he could not prevent military officials from making controversial statements. "We're a free people. And that's the wonderful thing about our country," he said. General Richard Myers, chair of the US Joint Chiefs of Staff, said it did not look as if Lt Gen Boykin had broken any rules. "The only thing I would say is there is a very wide grey area on what the rules permit," he said. The Bush administration has worked hard to avoid its campaign against terrorism being portrayed as a campaign against Islam. The religiously-charged comments of such a senior soldier will not help in that effort, says our correspondent. "The general's comments won't help improve America's battered image with Muslims"